They're not JUST rocket scientists. Outfitting the International Space Station also requires skills more typical of auto mechanics or construction workers. Mission Specialist Robert Behnken is scheduled to make three complicated spacewalks, or EVAs, (extravehicular activity) during the Shuttle Endeavour's 16 day mission. "A lot of the EVA that we do is high tech Do It Yourself kind of work. I would say to anyone who asks, 'who would make a good spacewalker?' I'd say, you know the guy that you know that you trust to change the brakes on the front and back of your car, that guy would probably make a pretty good spacewalker. If you trust him with your car to do that, he can probably do what we do," said Behnken. The big difference doing it while orbiting the earth? "You have to wear big bulky gloves," he laughed. The seven shuttle astronauts on STS-123 who will soon deliver the first element of the Japanese Kibo laboratory to the space station talked with reporters at the Johnson Space Center in Houston this week. Because European Space Agency astronaut Hans Schlegel missed a spacewalk from the shuttle Atlantis last month, I asked the astronauts about the seldom- discussed possibility of space sickness. "I can say that space is a very gentle place. So when you go up there for the first time the body gets surprised because it is different, it is zero gravity so the body starts adapting to the new environment. Don't fight it. Just let your body adjust by itself and you won't have a problem," said Doi. He said a day or two is usually enough to get in tune with microgravity– but longer if you start fighting it! There will be seven "human" astronauts aboard STS-123. But another passenger, a robot known as "Dextre," could someday take over some of the difficult dangerous tasks that astronauts now do on spacewalks. Veteran spacewalker Rick Linnehan, also scheduled to make three EVAs on the mission, is pretty impressed by Dextre. "When I was a kid I used to watch "Astro Boy" and "Gigantor", they were Japanese animations. 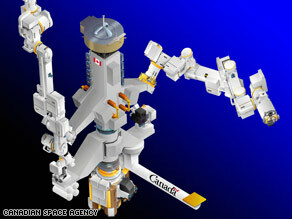 And this thing [Dextre] looks like "Gigantor, the Space Age Robot." I try to think of something people can identify with, we've got this giant robot with these giant arms, that's going to be climbing around on station and pulling things in and out and popping boxes, kind of like a giant R2D2. That's the best way i can describe it," said Linnehan. Both Linnehan and Mission Specialist Garrett Reisman also talked about how space exploration may give a different glimpse of how human actions such as pollution and deforestation impact the planet. "Everyone comes back with a new appreciation for our planet and how fragile it is, and our role as stewards of the environment. As far as collecting data and learning how to anticipate what will happen to our environment and what is the impact that humans are having on our environment, space offers probably the best platform to make those observations," said Reisman. He will be staying on the space station, while European Space Agency astronaut Leopold Eyharts will return to earth with the other six Endeavour crew members. Better check with the Phil Corso first, the EBEs might not want us to come aboard!